Total Weight: 100 Carats. All opal is best viewed in full sunlight to truly show its colors. If you require more than one parcel simple enter the number of 100 carat parcels you require. 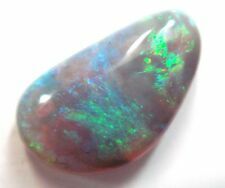 (Solid natural, genuine opals from Australia, NOT synthetic, not a doublet or triplet. – Fb : Biro Opal –. ORIGIN : LIGHTNING RIDGE . Lovely multi-color semi black (dark) opal :). LIGHTNING RIDGE - AUSTRALIA ! Lightning Ridge semi black opal, ready for you to final shape and polish. LRCR1738 total weight currently 3.37ct. Interesting pattern stone. Black Opal: Black Opal is found mainly at Lightning Ridge N.S.W. 600km northwest of Sydney. Origin Lightning Ridge, New South Wales, Australia. (non-precious opal) was discovered. Natural solid black opal loose stone 1.09ct - YouTube. Crystal opals are a more widely found across the various Australian opal fields. Crystal opals are characterised by their transparency. If you hold a crystal opal up to the light you will see that the light passes through the stone. Black Opal: Black Opal is found mainly at Lightning Ridge N.S.W. 600km northwest of Sydney. Origin Lightning Ridge NSW Australia. (non-precious opal) was discovered. Natural solid black opal loose stone 1.36ct - YouTube. Lightning Ridge Black opal, mixed rubs parcel, nice small stones to be cut, very bright, ready for you to final shape and polish. LRRR1812, weight currently 12 ct. LRRR1812 - YouTube. Black Opal: Black Opal is found mainly at Lightning Ridge N.S.W. 600km northwest of Sydney. Origin Lightning Ridge NSW Australia. (non-precious opal) was discovered. Natural solid semi black opal loose stone 4.21ct - YouTube. Black Opal: Black Opal is found mainly at Lightning Ridge N.S.W. 600km northwest of Sydney. Origin Lightning Ridge NSW Australia. (non-precious opal) was discovered. About opal colours photographs:The colours of an opal shown in photographs vary in different lighting and. Solid natural, genuine opals from Australia, NOT synthetic, not a doublet or triplet. - Fb : Biro Opal -. ORIGIN : LIGHTNING RIDGE . YouTube Video: " 1.4 ct FLAGSTONE pattern semi black opal stone video by opalfirst Australia ". Black Opal: Black Opal is found mainly at Lightning Ridge N.S.W. 600km northwest of Sydney. Origin Lightning Ridge NSW Australia. (non-precious opal) was discovered. Natural solid semi black opal loose 2.23ct - YouTube. Black Opal: Black Opal is found mainly at Lightning Ridge N.S.W. 600km northwest of Sydney. a “Crystal opal”. Origin Lightning Ridge NSW Australia. (non-precious opal) was discovered. About opal colours photographs:The colours of an opal shown in photographs vary in different lighting and. Black Opal: Black Opal is found mainly at Lightning Ridge N.S.W. 600km northwest of Sydney. Origin Lightning Ridge NSW Australia. (non-precious opal) was discovered. Natural solid semi black opal loose stone 2.75ct - YouTube. Black Opal: Black Opal is found mainly at Lightning Ridge N.S.W. 600km northwest of Sydney. All opal sold here is genuine solid Australian opals. a “Crystal opal”. Origin Lightning Ridge NSW Australia. Black Opal: Black Opal is found mainly at Lightning Ridge N.S.W. 600km northwest of Sydney. Origin Lightning Ridge NSW Australia. (non-precious opal) was discovered. Natural solid black crystal 2.32ct opal loose stone - YouTube. (non-precious opal) was discovered. Black Opal: Black Opal is found mainly at Lightning Ridge N.S.W. 600km northwest of Sydney. About opal colours photographs:The colours of an opal shown in photographs vary in different lighting and. Black Opal: Black Opal is found mainly at Lightning Ridge N.S.W. 600km northwest of Sydney. Origin Lightning Ridge, New South Wales, Australia. (non-precious opal) was discovered. Natural solid semi black opal loose stone 3.16ct - YouTube. Very Nice Large 4.8 Carat Solid Black Opal from Lightning Ridge. Body Tone N4. Brightness 4.0/5.0. -Natural Solid Black Opal from Lightning Ridge. -Body Tone N4. Colour: Purple. Yellow, Green, Blue. Black Opal: Black Opal is found mainly at Lightning Ridge N.S.W. 600km northwest of Sydney. Origin Lightning Ridge, New South Wales, Australia. Natural solid semi black crystal opal loose stone 0.92ct - YouTube. Black Opal: Black Opal is found mainly at Lightning Ridge N.S.W. 600km northwest of Sydney. Origin Lightning Ridge NSW Australia. (non-precious opal) was discovered. Natural solid black crystal opal loose stone 2.15ct - YouTube. Black Opal: Black Opal is found mainly at Lightning Ridge N.S.W. 600km northwest of Sydney. Origin Lightning Ridge, New South Wales, Australia. (non-precious opal) was discovered. About opal colours photographs:The colours of an opal shown in photographs vary in different lighting and. A dark based opal (semi-black) from Mintabie, with a colorful, bright pattern. Weight.1.13 ct. Size (mm).8.6 x 5.8 x 3.4. Black Opal: Black Opal is found mainly at Lightning Ridge N.S.W. 600km northwest of Sydney. All opal sold here is genuine solid Australian opals. Origin Lightning Ridge NSW Australia. (non-precious opal) was discovered. Black Opal: Black Opal is found mainly at Lightning Ridge N.S.W. 600km northwest of Sydney. Origin Lightning Ridge, New South Wales, Australia. (non-precious opal) was discovered. Natural solid black opal loose stone 1.31ct - YouTube. Solid Lightning Ridge light opal 5.86ct - YouTube. Solid Lightning Ridge light opal loose stone 5.86ct. Black Opal: Black Opal is found mainly at Lightning Ridge N.S.W. 600km northwest of Sydney. Lightning Ridge, NSW Australia. Black Opal: Black Opal is found mainly at Lightning Ridge N.S.W. 600km northwest of Sydney. Origin Lightning Ridge NSW Australia. (non-precious opal) was discovered. Natural solid black opal loose stone 0.88ct - YouTube. All opal sold here is genuine solid Australian opals. About opal colours photographs:The colours of an opal shown in photographs vary in different lighting and. a “Crystal opal”. Lightning Ridge, NSW Australia. Body Tone N5 Brightness 3.5/5.0. -Natural Solid Black Opal from Lightning Ridge. -Body Tone N5. Colour: Red, Orange, Yellow, Purple, Blue and Green. -Pattern Mackerel and mixed block flash. -Weight: 3.10 Carats. Black Opal: Black Opal is found mainly at Lightning Ridge N.S.W. 600km northwest of Sydney. Origin Lightning Ridge NSW Australia. (non-precious opal) was discovered. Natural solid semi black opal loose stone 2.80ct - YouTube. Green and blue with orange, yellow (multi coloured) / N7. Lightning Ridge, NSW Australia. All opal sold here is genuine solid Australian opals. Black Opal: Black Opal is found mainly at Lightning Ridge N.S.W. 600km northwest of Sydney. The matrix opal has an even opal patterns throughout the black iron stone. The original cutting of the rough piece has been design for use as in a quality jewellery piece. Queensland matrix opal. Naturally occurring opal embedded in iron stone. Black Opal: Black Opal is found mainly at Lightning Ridge N.S.W. 600km northwest of Sydney. All opal sold here is genuine solid Australian opals. Origin Lightning Ridge, New South Wales, Australia. (non-precious opal) was discovered. All opal sold here is genuine solid Australian opals. Black Opal: Black Opal is found mainly at Lightning Ridge N.S.W. 600km northwest of Sydney. Lightning Ridge, NSW Australia. Solid black opal loose stone 1.03ct - YouTube. Rainbow Chakra Gemstone Set - Black & Orange Opals, Rubys & More!